I had one chicken breast hanging out in the fridge that I needed to use up, but there are three of us for dinner so what to do with it was sort of haunting me. I could have thawed out some more chicken, but time got away from me this week so that wasn’t an option. I did some searches for “1 chicken breast recipe” and found quite a few stir fry options. It’s a great way to make a small amount of protein feed a few people. Budget-friendly recipes are always great to have in your repertoire! 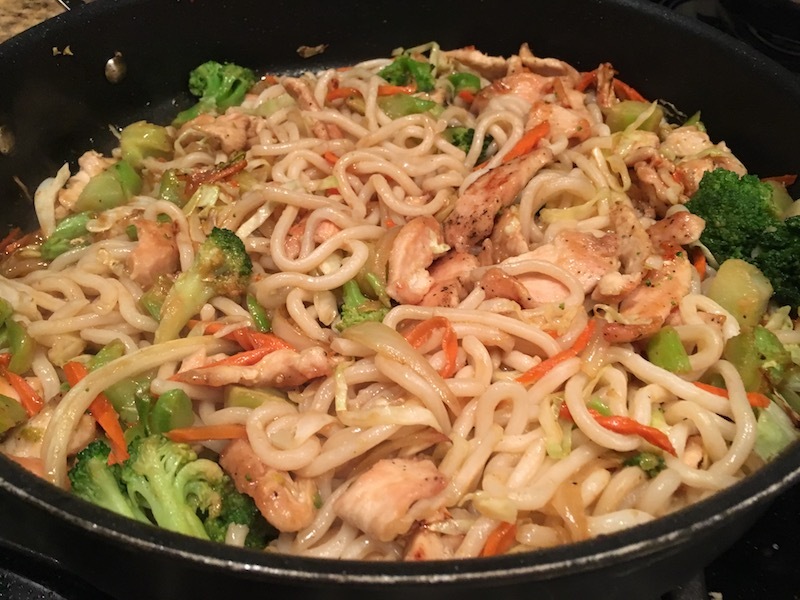 I’m a big fan of those fat KA-ME udon stir fry noodles and always have them in my pantry – so I put this together! Hope you enjoy! Quick, Tasty, 1 Chicken Breast Recipe! Heat vegetable oil in a large skillet or wok, dust chicken with 2 tsp cornstarch, salt, pepper and add to hot oil. Stir and fry until chicken is golden brown. Remove from pan and set aside to drain. In the hot pain, add onion, garlic and julienne carrots and stir fry until onion is translucent - add in broccoli and cabbage and stir together. While veggies all cook together, put your KA-ME noodles in the microwave for 90 seconds. Punch a hole in the pouch first. When noodles are done, dump into a small colander and rinse with hot water to separate - let drain until veggies are done. In a small bowl combine the broth, soy sauce, ketchup and cornstarch. 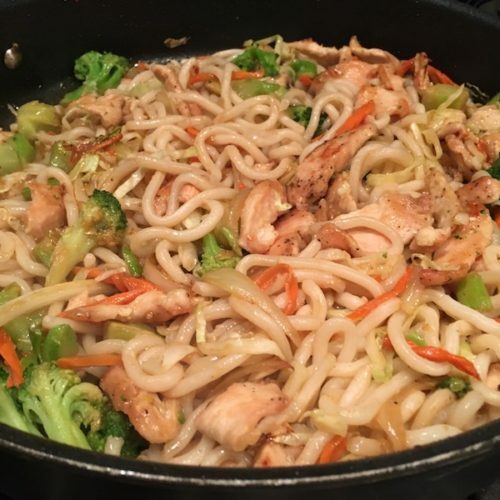 When veggies are soft, add in chicken, noodles and sauce. Stir together well, heat through until slightly thickened and serve immediately. 20 No Cook Dinner Ideas – Beat the Heat!